When I retired from the daily grind of honest labour, Cuppa more or less retired from cooking, and we mutually agreed that I should take up that task. 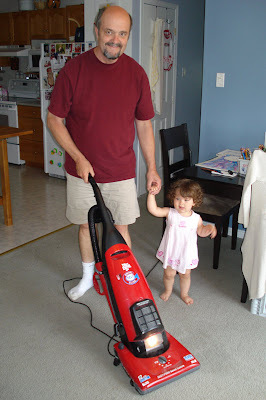 I say that she more or less retired from the chore because it wasn't a complete repudiation. She still cooks the occasional meal,for example, and almost always rounds up what is to be had for lunch. But if a meal is to be cooked from scratch, I am usually the one to do it — with mixed results I must confess. Unfortunately. 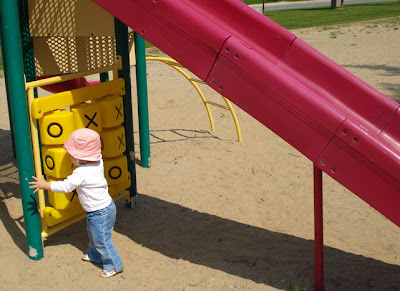 On the whole, I manage, but I do stumble at times, and something that I recently read in another blog reminded me of a faux pas from one of my early attempts. Fortunately, many fine, instructive cookbooks exist, but as careful as some might be, they can still take certain things for granted. Exhibit A: I give you the lowly onion. How is an unkitchened man supposed to know that a green onion is not an ordinary onion of the kind that we always have about and regularly consume? They always looked kind of green to me. It took one recipe and one wife to teach me the difference. As the mountain of onion grew, I began to grow rebellious. I was chopping my fifth onion, and the bowl was already overflowing. so when Cuppa entered the room, I cast my gaze from the onion hill to her and petulantly declared, "I don't care what the recipe calls for, I've chopped enough onions!" It was then that my dear wife gently explained through tears of laughter the difference between green onions and yellow onions. Education is a wonderful thing. 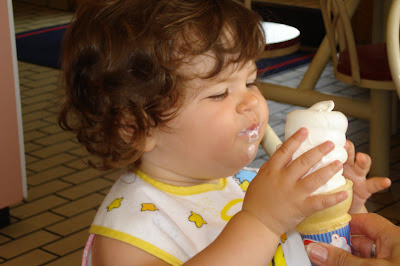 I thought it would be fun to take her to DQ and let her try a soft ice cream. I guess it was fun but not as much as I expected because the concept is still beyond her. 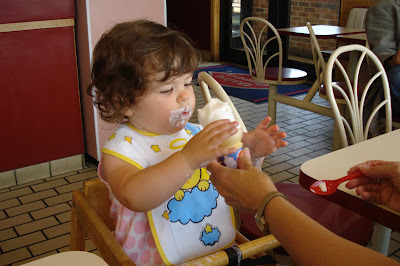 As the photos reveal, she wanted to grab the actual ice cream. Her brain isn't ready to grasp the concept that she should hold the cone and gently lick the ice cream. But she did try to hum along to Waltz Across Texas when I danced with her later. That was a first — a very cute first. Someday soon I will blog about something other than my granddaughter, but she seems to be in a very cute phase in her development right now, and I do spend the day with her ... and am rather smitten. Sorry ... but here we go again. The kid melted my stone heart again yesterday. 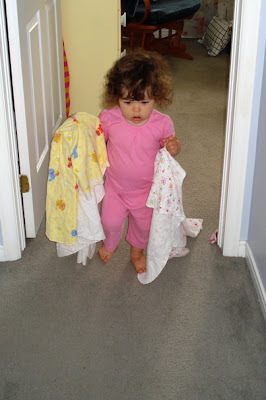 Sometime every morning, she gets changed, and then I go to the side door to get ready for our walk. She's soon after me and anxious to get on with it. Gramma outs her hat on, and off we go. We did that again yesterday morning and had a great walk on a great day. Later that same day ... it was after supper, and it was time for the Grands to head home. But first I changed the girl while Maw was busy doing this and that. Then I made my way to the door. But something about changing her cued The Bonnie Wee One's expectations, and didn't she find her hat and follow me anxiously to the door. 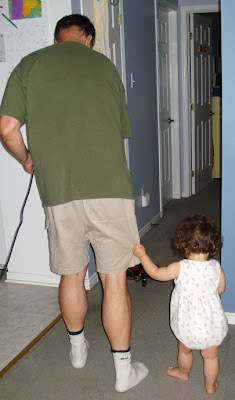 Melted my heart, I tell ya, and I must confess that, yes, she did get another little walkie: much shorter than the morning version, but I couldn't bear to disappoint her. 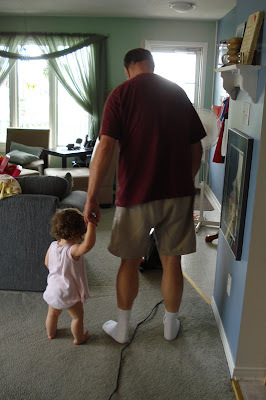 Earlier in the day she leant a helping hand with the vacuuming. I don't think I could have managed without her help. We had a fierce storm in the afternoon. Here she is enjoying it. The worst of the storm was past as was the best of the video op, but I find it cute nevertheless. In a gesture that was extremely considerate, Turtleguy from Calgary dropped into see us yesterday. 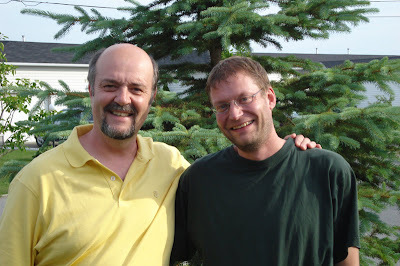 He was on the third day of a very long trip from Calgary to Quebec City, and despite being only six more hours from his destination, he made a side trip to see us. While it wasn't too much of a detour in terms of distance, it did cost the boy three precious hours of travelling time, so hats off TG. He was in time for a quick supper that didn't turn out so well and he was soon off again. But first there was time for a quick photo op. I've met bloggers before, Paul and Julie, and Methatiam and Chelsea, when we were in Arizona two years ago. All meetings have turned out well. Maybe there will be more encounters with more bloggers in the future. Who knows? Why I didn't think to mention it yesterday, I must put down to yet one more of those increasingly frequent brain cramp. One difference between fiddling and violining is often the length to the bow stroke. Most fiddlers use a short bow stroke most of the time. On the other hand, we tend to picture a concert violinist using a a long, smooth stroke. I have seen some fiddlers who may have been classically trained who practise long bowing, but it's not typical. I'll repost a clip of Natalie McMaster below to illustrate. Just look at her bowing technique for 20 seconds or so to see what I mean. Dabrah of Fickle Muse has asked a good question, one that puzzles many, including me not all that long ago. It's about the difference between a fiddle and a violin. Well, the instrument is exactly the same. It's the style of play that's different. Fiddlers play jigs and reels and hornpipes and such: frequently, though not always, at great pace. Violinists play in symphony orchestras etc. That's an incomplete answer, but I think it gives one the general idea. I think we all recognize fiddling when we hear it, but here are two clip of Natalie McMaster, Canada's most famous fiddler. 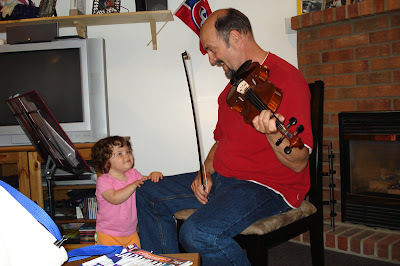 We have tons of great fiddlers but she's the one who everybody knows. In he first, she plays at the Hollywood Bowl. In the second she demonstrates a song at a fiddling school. Sorry to all of the non-family readers, but this is to be another Nikki Dee post. She was very cute yesterday. 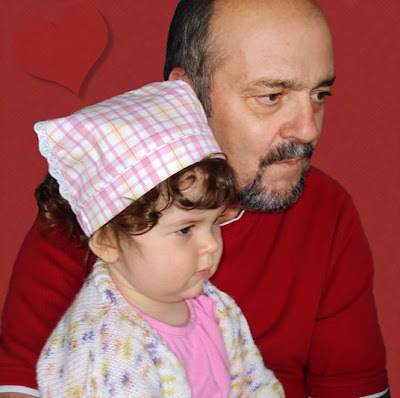 Since she had her little rituals which only Gramma seems to comprehend, I don't put the kid to sleep much. However, she came to me blanket in hand while I was sitting on the couch yesterday. So, I took her to the bedroom, rocked her a bit, and put her to sleep. Yay Grampa! I took this picture when she woke up and played with her little busy box for a few minutes. At lunch time, I decided that I needed to take this video. The kid goes into a whiny-sounding song when she eats. I mean, it sounds whiny, but it's really just sort of a self-satisfied drone that she produces. She does it all of the time, but I suspect that it will stop without notice one of these fine days, so I decided to try to capture it while I could. She cracks me up — not just me but everyone. We had some outdoor time after lunch, but she eschewed her new play structure in favour of a nearby patch of hard dirt and gravel. But then Skyler came along and captured her attention. Skyler likes to come over for cookies whenever she can. Having been treated poorly in her early days, the poor little pooch tends to keep her distance from me, but the cookies are helping us to make progress in earning her trust. 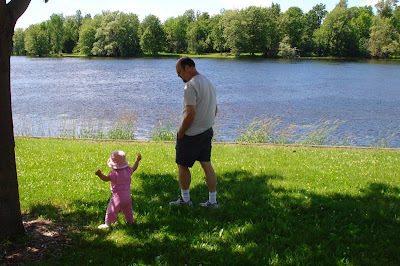 Finally, it was time for a little saunter in the park where Grampa's job was to guard her from walking into the river and disappearing downstream. The latest hitch in my catching up with blogs is that Reader decided to go crazy and mark old blogs as unread. That confused me, so I decided to mark all as read and will begin anew. Sorry if I missed a few of yours. Meanwhile, since I was discussing music yesterday, let me note something else that's odd about music and brains. I frequently notice that when one song is over on the CD that I start humming the next one before it plays. The odd thing is that if you were to ask me what songs were on the CD, I wouldn't have much of a clue. But something somewhere deep inside my cranium does seem to know. Weird. In another anecdote about music, one of the instructors at the workshop mentioned that someone she knows was turned away from lessons by one teacher when she was nine years old — because she was too old! Can you believe that: too old at nine? It was that teacher's belief that one had to start by the age of four. Anyway, the upshot is that this person (whom I don't know) has gone on to become a fine, well know fiddler. Thanks also for your various comments about playing an instrument, especially Dora's encouraging comment. I do derive a great deal of satisfaction out of playing my heart out in the basement. As a side note to age and learning to play an instrument, here is a little snippet that was recently told to me. After yesterday's blog, some of you expressed interest in Peter Robinson's Inspector Banks series. Robinson is an expat living in Canada who sets his Banks series in Yorkshire. The most recent novel, Friend of the Devil, was quite good, but it's fairly new and still in hard cover. You should be able to find cheaper paperback novels on the shelves. I don't quite know how or why it happens, but all of a sudden I am very behind in both the reading and writing of blogs. For one thing, I have been reading more. Among other books, we had the latest Peter Robinson mystery (Inspector Banks) in from the library. Once Cuppa read it, I didn't have too much time before the due date, so I made it a priority. It was quite good. If you like mysteries, especially British ones, and haven't read this series, I suggest that you consider remedying that. There have been other events going on too, including a fiddle workshop on the weekend. I had never been to one before, and my flaws were exposed: my brain doesn't process very quickly. I am finding out that fiddling is a different sort of beast. So many players play primarily by sound and memory rather than by sight (ie note). The instructor plays a bar and you are supposed to play it back. While that may work for me for a bar or two, my brain soon refuses to keep adding new stuff until it has mastered the old. The first instructor took more pity on those of us who prefer the assurance of having sheet music in front of us, but the second was a little more ruthless. Nevertheless, it was an interesting and worthwhile experience despite the fact that I am rapidly coming to the realization that I will always be a beginner in terms of ability level — an advanced beginner, but a beginner nonetheless. I guess that's okay. Well ... it has to be okay. Doesn't it? There are fiddlers, very accomplished ones, who barely read music. The one instructor that we had on the weekend said that he played for years (I think he said 14) before he learned how to read music. It's just a whole different world. While it's fun to be on the fringes of it, that's where I will remain. Niks hasn't exactly been speedy to embrace certain milestones: rolling over, crawling, and now walking. 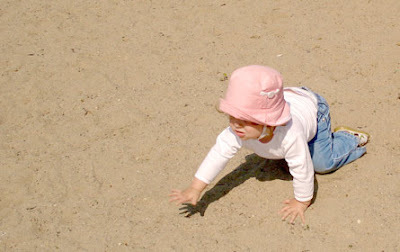 She has been physically able to walk for quite some time now, but has preferred to crawl or hold onto an adult's hand. However, just in the past few days, she has begun to step out on her. As the video clip shows, she raises her arms in Praise the Lord manner and waddles off. As someone who was brought up in pentecostal circles, I'm not too sure if this Praise Walk is a good or bad thing. This picture represents the newest wrinkle of our babysitting gig. Cuppa needs to get some painting done, but the kid tries to climb into the middle of things and thereby renders accomplishing anything impossible. Clearly something has to be done, but Niks would most definitely not countenance being penned. So ... we have penned Cuppa instead. So far, it is working. I didn't have a lot of hope when it started. Three guys calmly walked onto the stage and took their sets without any sort of attempt to capture the audience's attention. Without fanfare, they announced their first set and began to play it. It was fine but no better than what I've heard elsewhere. But it kept better and better. By the end of it, my jaw was mighty sore from having hit the floor so often. The three musicians were Gearóid Ó hAllmhuráin, a concertina player from Ireland; Pierre Schryer, a Canadian fiddler; and, local guitarist, Ian Clark. These guys are not a group but three Celtic musicians who got together for a few gigs, this Celtfest warmup concert being one of them (the main even takes place in July). Their concert was more or less a jam session, but with three musicians of this calibre, it was extremely high quality. They improvised, emoted, and played off one another to our great delight. After three hours with only one break, we went home thrilled and amazed. They were all excellent, but Pierre, the fiddler, really blew me away. For example: they had a local musician come up on stage and play the harmonica (don't laugh, he was fabulous). He played very fast and Pierre just sat and listened for a while. Then he picked up the music and began to play and was soon throwing in trills and keeping up with no problem. Amazing. Then Pierre's brother came on stage. For a moment they hummed and hawed about what to play, and then one of them started, and the other just started playing along, and the two of them just about ended up tearing the roof down. Wow! This will go down as a very memorable concert for me. I keep seeing various popular musicians on tv, those who sell gazillions of albums and who earn trillions of dollars, and I generally end up shaking my head in bewilderment over what I deem to be very ordinary stuff. Then, there are the true musicians, like these three guys like this who probably just scrape by despite possessing such amazing talent and ability. Of course, it's old-fashioned, traditional, non mainstream music, but who wants to be run-of-the-mill mainstream anyway? Well, although I wish I could have taken you there with me, I can't, but I can link to this YouTube clip of some fine fiddling. When I take Nikki Dee out for a walk, I certainly have my choice of conveyances, but the little car is the favourite because I can push it with one hand. 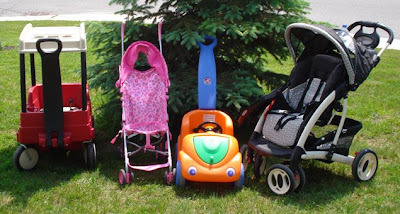 I do prefer the smoother and quieter ride of the more conventional stroller on the right, but it still requires two hands to control it properly, and that makes it a little less comfortable for the pusher. I don't prefer pulling the wagon. I used it once, and that was enough. Of course, the fold up stroller is usually in the back of our vehicle. It's easy to transport but not all that comfortable for a normal walk about the neighbourhood. So ... as you can see, the kid certainly has enough ways to get around, but you will notice the absence of an old-style pram. I wonder if anyone uses them any more? On a normal walkie, I avoid the park because it's hard to drag her away once she's there. 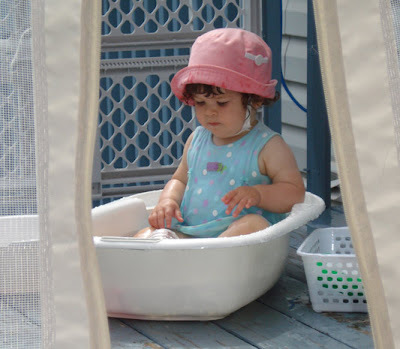 But we did make a special trip the other day, and after she enjoyed a swing, she explored other options. Although with so much to see along the way, it's hard to remember where you were heading. How about a game of X's and O's? Nah! 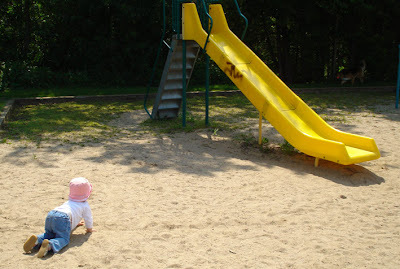 I think I'll head to the big slide. 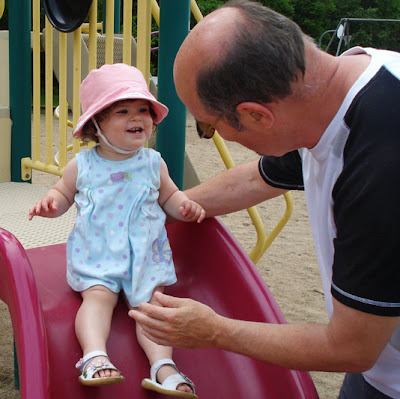 With a little help she'd walk up the slide and then Wheee! down with a concerned Grampa holding one hand (of course). She had a lot of fun, but neither of us had fun when it was time to leave: she because she doesn't understand and me also because she doesn't understand and gets very upset with me. She lets me know of her disapproval of my strong arm tactics in no uncertain terms. Here's a pretty quick post in passing: two photos from yesterday. 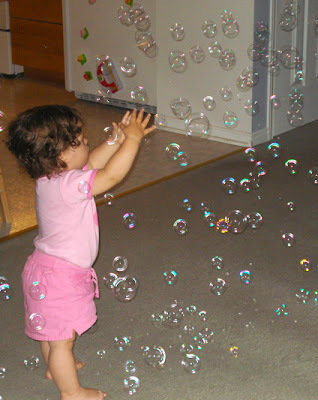 Nikki Dee's father got a bubble machine for Father's Day, but the kid seems to like it too. Not seeming to grasp the poignancy of the occasion she didn't provide Grampa with much special time, we did manage to get a very busy girls to sit with Grampa just long enough for a quick photo — a very quick photo. This week, just for a change, Foto Friday features The Bonnie Wee One aka Nikkie Dee aka aka Niks aka ND aka Smudge. I have posted before how she loves to ride an ahem horse (where ahem is a word for a male part). However, we don't sing ahem; we sing the real word. Various concerned parental and auntie units have implored us to find and employ an alternatives such as big horse, but the ahem word seems to be stuck in our old heads. Anyway, she'll no doubt tire of the ride and won't remember that word as she grows. But in the meantime, that's what I sing to her, and as you can see in the first two photos, she quite enjoys the ride and sure doesn't seem to mind the lyrics. Can a female legitimately do Ride A(n) Ahem Horse? 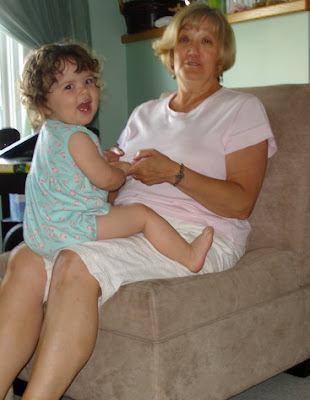 Regardless, Gramma also does the song with the kid, and she loves it. Whenever Gramma starts it, Niks always looks around at me because she wants all to share in her most excellent adventure. Then, there's the shadow scenario that I mentioned just recently. As you can see this shadow is still sticking close. Sometimes, it's mighty difficult to eat my breakfast in peace. 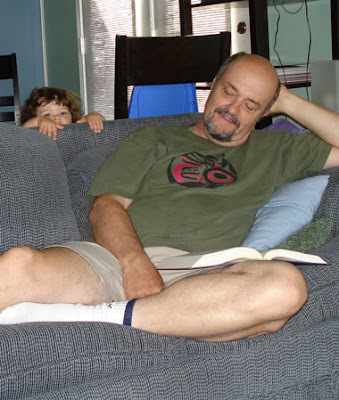 And when I try to read a few lines, my shadow seems to be alerted. My shadow even helps me vacuum. I'm sure you can imagine just how helpful she is. Then, she insists on being rewarded for being such a diligent shadow, and I am forced against my will to take her to the park. See her laughing at me in my helpless plight? 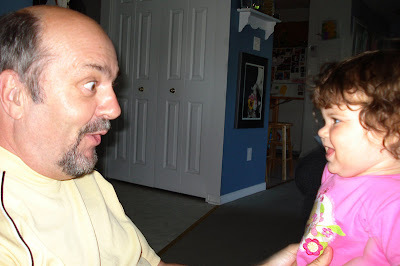 There are some who believe that she has me wrapped around her little finger, but, of course, it's not at all so. Not at all. The chive plant that has been with us for almost forty years has bloomed again. Thesha transported a section of it from our Sarnia garden several years ago, and it does well for her. We don't have the same success with the division that we planted at our place across town, which is odd because one year in Sarnia we divided the plant back and carelessly tossed the excess in a plastic container that was lying about. Somehow we negligently left the container lying bout, and didn't the plant actually grow and flourish despite its neglect. Therefore, it's a bit of a mystery why we have so much trouble with it in this place. Who knows how old the plant really is because Audrey gave us a division of her plant way back in the seventies when we were neighbours. I wonder where she first got it. How far back does its history extend? Was it passed onto her by someone near and dear, someone as meaningful to her as she is to me? Like Dad's forget-me-nots, Audrey's chives serve to remind me of the person from whom we obtained the plant, of Audrey and the lesson of her life, or at least the lesson from her life that is most relevant or prominent to me. You see, shortly after we got to know her around the mid-seventies, she was diagnosed with cirrhosis of the liver. Since she was a tea-totaller, this was a rather freaky disease to be struck with, but to her great credit she always refrained from doing the "Why Me?" whinge. You'd think under the circumstances, she'd be entitled, but she resisted. That's certainly part of her lesson to me. Audrey lived with the disease for almost thirty years: much, much longer than any doctor thought possible. She remained as a vital human being on this blue planet when everyone else in her support group passed away. Although that's not really her lesson to me, it most likely resulted from her exemplary attitude, which is her lesson to me. She never complained, but always faced the world with a positive attitude. In her fifties at the time, she had just begun to take up and enjoy golf. Young Thesha would help her in her practice by chasing and collecting and returning Audrey's wiffle balls in the backyard. Of course, she had to give give the sport up, but Audrey never complained. I'm sure that the disease always affected her. but sometimes it would attack virulently. However, Audrey would endure these attacks, by going to bed for however long it took for them to abate, often three days or longer. When the crisis ebbed, she'd get up and go cheerfully about her life. We meet a lot of people on our walk through life, and few pass on important lessons, but this lady taught me a lot through her courageous, cheerful, and resilient attitude. She showed me that even when life becomes hard and seemingly unfair, one can choose to lead a happy and positive existence. They say that happiness is a choice, and Audrey was a living example of to me of how, by making that choice, one should deal with the vicissitudes of life. While I rather doubt that I could face life's harder knocks with an spirit equal to hers, I think that I have done and will do better than I would have had I been deprived of her shining example. 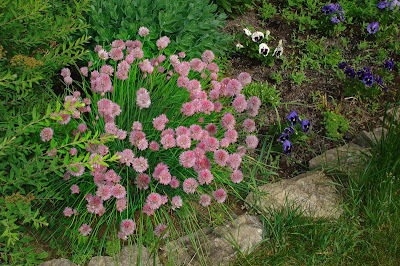 And when I begin to forget, her chives tend to remind me of Audrey's lesson every summer, particularly when they bloom like this in late spring. Am I the only one who can't spell 'accommodating' or any of its variants? TG for spell checkers, for I have been getting that word wrong for about six decades now. I am not a terrible speller, but I have a mental block over that word and a few others. Extroversion (28%) low which suggests you are very reclusive, quiet, unassertive, and private. Accommodation (70%) high which suggests you are overly kind natured, trusting, and helpful at the expense too often of your own individual development (martyr complex). Orderliness (68%) moderately high which suggests you are, at times, overly organized, neat, structured and restrained at the expense too often of flexibility, variety, spontaneity, and fun. Emotional Stability (60%) moderately high which suggests you are relaxed, calm, secure, and optimistic. 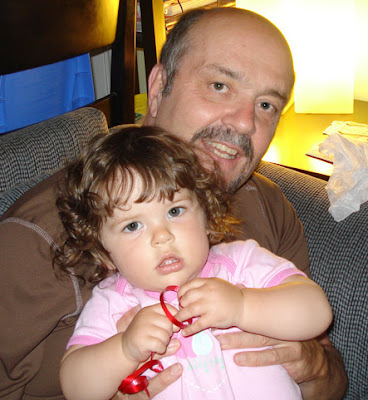 It's a long time between kids and grandkids, so one forgets a lot about babies and toddlers — almost everything as a matter of fact. In a way that's good because it tends to bring back the sense of wonder that accompanies a firstborn. 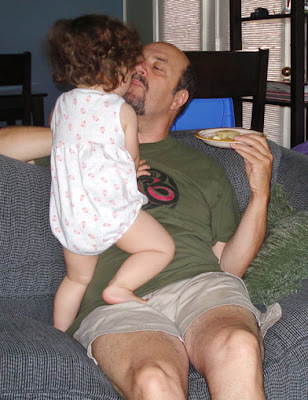 How delightful in the past week to catch the occasional word escaping from The Bonnie Wee One's lips. In each case except the third, it has been a one-shot deal, but each incident delighted this old codger to no end. 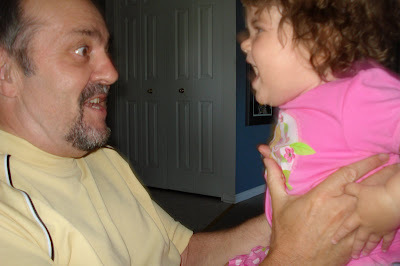 First she appeared to say "Grampa" as she stumbled toward me. 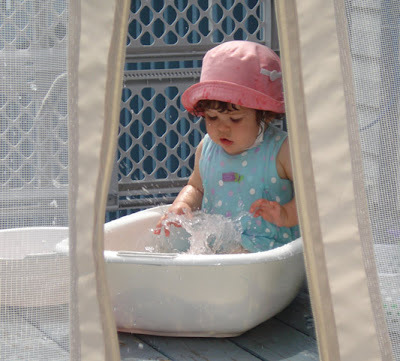 Then it was "birdie" as we gazed upon robins worm-hunting in the backyard through her bedroom window. 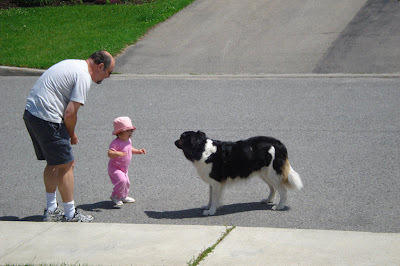 Finally, it was "truck" as Grandma made a big deal (again) over the garbage truck's weekly passing. 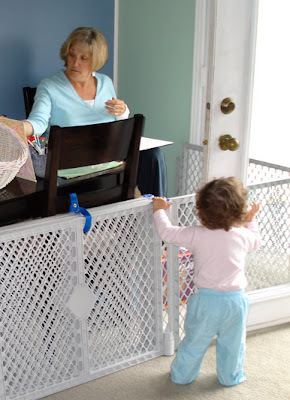 In fact, she seemed to try that one a few times with varying degrees of success — the kid I mean not Grandma. This is too much fun. And the bonus is that we get to go home at night to recuperate. Last week, I decided that seeing as I spend every weekday over at Nikki Dee's place, I should keep a few essentials over there. Up until then, if I wanted to shower during the day, I'd come home. Don't worry overly about the seeming extravagance of the car trip because it's only a short hop across a smallish town. Nevertheless, it's more wasteful and time consuming than it need be, so a change in modus operandi seemed to be in order. Therefore, I took my normal ablutive accouterments over — soap, shampoo, shaving cream — but wondered what to do about shaving. "Aha! I have an older Gillette Mach 3 [doncha love the powerful moniker?] sitting idle somewhere, so I'll buy some blades for it and have a shaver in both places." However, upon arriving at the local, friendly, neighbourhood, razor blade shop, I was not thrilled to see that a package containing four, tiny blades would set me back approximately sixteen dollars. Flabbergasted I was. As I was trying to gather what remains of my fast disappearing wits, I happened to glance a little way down the shelf . . . . . . . and saw that I could buy four Gillette disposable razors for seven dollars — on sale for five no less! They sure looked similar to the exalted Mach 3's, so I bought 'em and saved seven bucks. I tried one out yesterday and am chuffed to report works just like the real (and expensive) thing. The razor blade companies have quite the little marketing ploy going; they practically give away the handle thingie and then charge exorbitantly forever thereafter for the blades. And have you noticed that the ink jet printer companies have followed the same canny model? If you shop around and not even too rigorously, you'll find that you'll be able to purchase a new printer complete with ink for less that what the refill will cost. These guys have certainly figured it out — take a bit of a onetime hit in order to reap extravagant dividends forever after. And since they all follow the same marketing model, it's not like the consumer can send a message by switching brands. So whaddya gonna do, eh? Sunday Morning: before a certain chore must be done today, I have a bit of time on my hands. So, I have chosen a few photos for your viewing pleasure. You're welcome. But before I get to them, I must tell you that I am blaring music in an effort to rid my brain of an ear worm. I hadn't heard that term until a few weeks ago when I came across it twice within a week, once from reading and once from hearing. It's simply the term that some use for a song that gets stuck in your head. Usually it's just a fragment of a song, and it tends to drive one to distraction. In my case it was Raffi's Bamana Phone, and I'll allow you three guesses should you need that many to guess why a Raffi song is stuck in my head. So, the iPod is in the speakers, and I'm playing it rather loudly — considering the size of this room and that I'm only about a yard from the speakers. It's actually not that loud in decibel terms. It's turned hotter than the hinges of hell here in the past few days, so we allowed Nikki Dee a little water play after taking her to the park the other day. 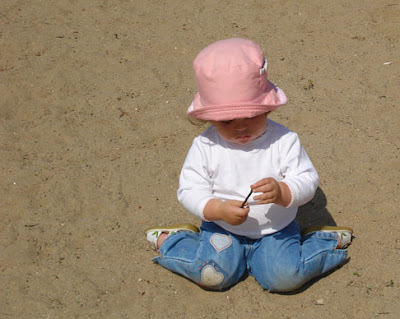 The dainty little princess got rather filthy playing in the sand, so the water both cleansed and cooled. I took these pictures through a gap in the gazebo-style tent. She seems quite contemplative in the first. 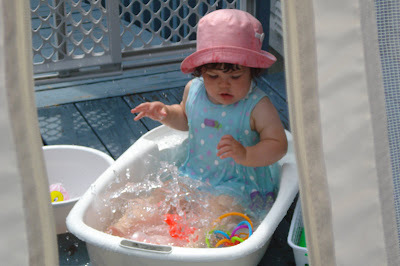 And then the splashing began in earnest. As you may have gathered, I take little Nikki Dee for a walk every weekday morning around 9:30; well ... I walk and she sits and rides, which is a good deal if you can get it. For the past few mornings, I have been a little disappointed in some of the neighbours, not necessarily the immediate ones but those a little further along the route. There must be at least four properties that I pass that have recently mowed their lawns ... and not bothered to sweep the clippings off the sidewalk. And I wonder why people behave that way. Is it intentional, thoughtless, rude, or an in-your-face attitude? I should imagine it's a somewhat innocent mixture of thoughtlessness and laziness for most, but leaving a job unfinished like that bothers me a bit because too many people seem to be either deliberately or unconsciously inconsiderate. I'm not sure when I became conscious. In fact, I'm not even sure if I'm always a conscious human being even now. But I think that most of us do better as we get older. For all I know there may have been a time when I left lawn clippings on the sidewalk after mowing. Perhaps not, for I have recollections of blowing it to the side a long time ago in an old house in a faraway place when the girls were little and I was a young father. But I may not have always done it, or I may have been thoughtless in countless other ways. A few years ago, I opined to a former neighbour, that I think that people finally mature around the age of thirty-two. Oh I just picked that number out of my hat, but I imagine that you take my point. It takes a while for most of us. The funny thing was that said neighbour breathed a sigh of relief because she had just barely qualified. I know that we all have our own inner schedules and that's there's no specific magic age, but it takes most kids awhile to grow up in these times. I also know, for I have taught some, that there are some very mature-for-their-years teenagers and/or college students out there, so I am not making a blanket statement but just reflecting on things based on recently seeing multiple houses leaving their lawn clippings on their sidewalks. All of that lofty thought (as if) from lawn clippings! But really, when did you grow up? Was it when you moved out of your parents' home, when you got your first real job, when you had your first kid, or bought your first house? How old were you, do you reckon? I seem to have acquired a shadow. She seems to be there wherever I go, whether trying to play the fiddle (above) or trying to write a blog (below). In almost 61 years, I had yet to discover a four-leaf clover, but the other day when I was doing some garden work, I looked down and there it was. Unlike the two in the photo below, it was a pretty doggone perfect specimen. However, since I was busy attending to chores, I placed it on the hood of the car and continued to weed and water. Of course it stormed mightily before I again thought if that good luck charm, and of course it was long gone by the time that I did think of it again. In the two days that have since passed, I have searched for another — to no avail. However, as I was finishing today's version of outdoor chores, I was contemplating writing a blog asking whether it had been good luck to find the clover or bad luck to lose it so quickly. But as I was about to climb up the back stairs into the house, I looked down again and thought that I saw another. However, when I picked it up, it was actually, believe (beleaf?) it or not, a five-leaf clover. It's the one on the left in the photo below. I've numbered the leaves because it's almost impossible to spot the fifth without looking at it in three dimensional real life. Beside it on the ground and also in the photo, I found the other clover: just a plain, ordinary, humdrum, regular, run-of-the-mill four-leafer. 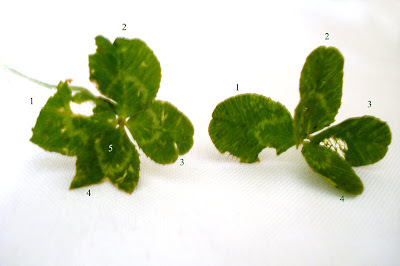 It's a rather ratty specimen, so you'd be excused for doubting whether it is indeed a clover. But indeed it is. Questions abound. Was the original finding and losing good or bad luck or no luck at all? Have you ever heard of a five-leaf clover, and if so what does it portend? Does a ratty, tired and worn four-leaf clover count for good luck? What the heck is going on in my tiny yard to produce three beyond-three-leaf clovers when I have never discovered even one in my previous 61 years? I eagerly await your educated and elucidating responses. Thank you very much. Sincerely, ACAC (All Confused AnvilCloud). ... I did something that I hadn't done for a very long time. For some unfathomable reason, I was moved to click Next Blog at the top of the blog that I has been reading. As someone much younger might say, I was weirded out by the results. I was transported to 15 non-English blogs in a row. So, I tied it again — seven times as a matter of fact — just to see how random that result had been. The highest number of consecutive foreign-language blogs that I hit in those seven experiments was 5 while 2 was the most common number. The highest number that I ever obtained for consecutive English blogs was 2.